Some two miles south-east of Coldstream in the county of Northumberland, and in view of the main road along which the buses run nightly between Edinburgh and London, on a grassy knoll stands a granite cross bearing an inscription and a date. The inscription reads: To the brave of both Nations; and the date: September 9th, 1513.1 This stone marks the spot where, at the close of that fatal day, all that were left of the Scottish nobility, fighting in defence of their mortally wounded King, perished to a man under the halberts and arrows of Surrey’s English levies. Now the existence of such a memorial is in itself no rarity. 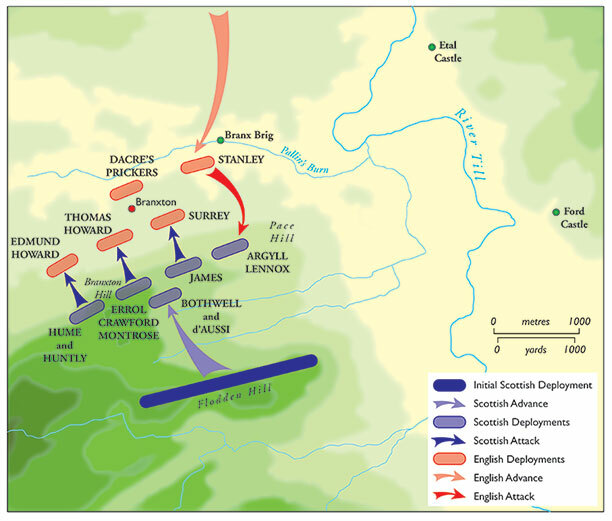 There have been battles a-plenty both before and after 1513; and monuments commemorating the clash of armies are to be seen on moors, in fields and on hill tops throughout the length and breadth of Great Britain. Nevertheless this one stands somehow apart, having an aura of mystery and horror all its own.